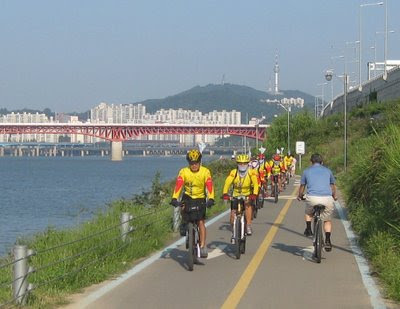 A group of cyclists powers along the bicycle path on the northern side of the Han river. PS - I have been using the scheduled post feature of late but yesterday I stuffed up the date and time, so this post has gone up a day late. Sorry folks! 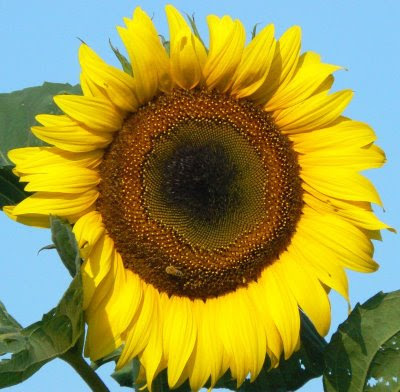 A sunflower in Hangang park. If you can spot the bee it will give you some idea of the size of this flower. 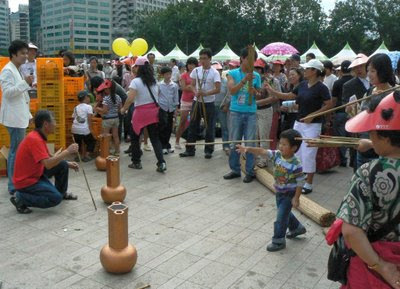 A little boy plays tuho (투호) as part of activities staged in front of City Hall. Tuho is an old Korean game of skill that involves throwing arrows (or in this case sticks) into a jar or vase. This dragonfly seemed particularly fond of the nut it is shown holding on to. As I moved in to take a macro shot it would fly away, only to come back to the same position a minute or two later. 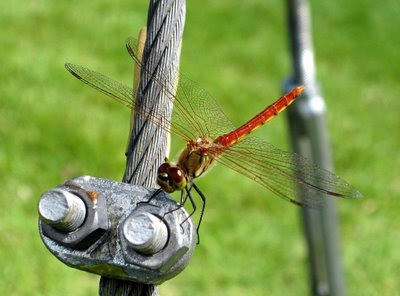 I must have done this 5 or 6 times and on each occasion the dragonfly would come back to exactly the same place. Maybe he thought the two nuts were the eyes of a giant lady dragonfly, and the steel cable her body?? The last of my Seoul Plaza chili series this week. This time an arch made up of the fiery little devils. 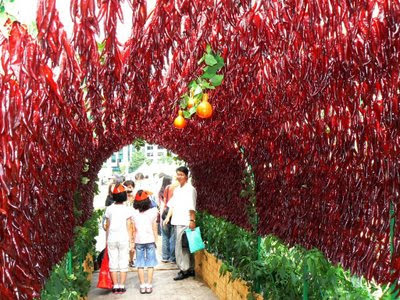 Two gigantic faux red peppers made up of thousands real ones on display in Seoul Plaza on the weekend. 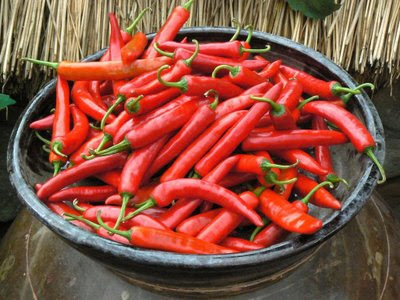 Gochu (고추) is the Korean word for red pepper. It is also a euphemism for the male member (as this t-shirt alludes to). This bowl of gochu was on display in Seoul Plaza on the weekend as part of promotion of all things gochu. I'll post some more images of this event over the next week. I looked out of the window of my apartment yesterday and saw this gentleman on the roof of a nearby building taking photos of the street below. 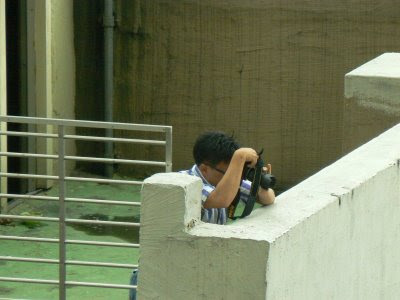 I grabbed the Lumix DMC-FZ7 and took this photo of the photographer. I hope that I will be forgiven, but the picture today is a little off-topic in that it was not taken in Seoul. Nevertheless, I hope that you will find it interesting. 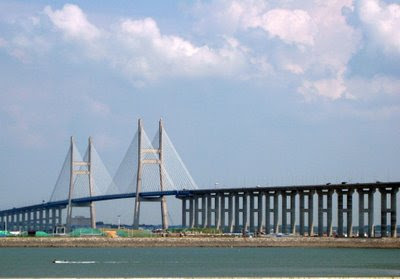 It shows the Seohae Grand Bridge, currently South Korea's longest bridge, which is about 65 km south of Seoul. 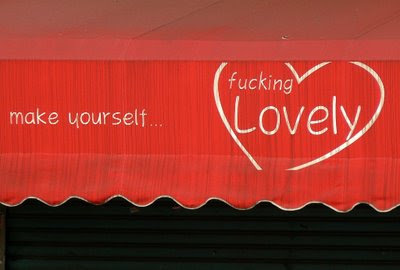 A "classic" sign above a store in Itaewon. 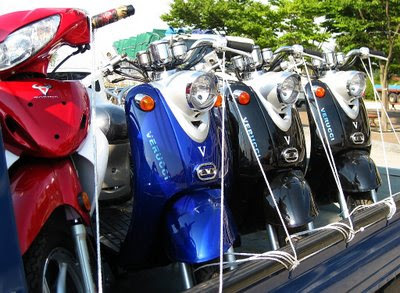 I was travelling south of Seoul on business yesterday and saw this truck loaded up with Verucci motor scooters outside a roadside diner. There was an article in the local Korean press recently about how a lot of folks are turning to riding motor scooters to lessen the impact of rising fuel prices. Decorative metal-work on a park fence in Nakseongdae. On the weekend I was invited to a party with folks from Australia, Austria, France, Germany, Italy, Japan, Korea, Russia and the USA; a bit like a satellite meeting of the UN, only much more fun! 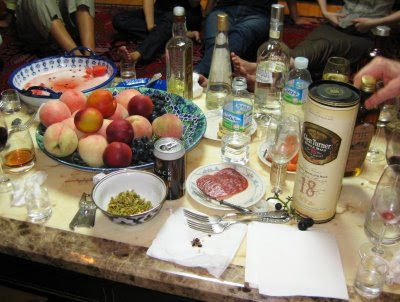 I took this snap of one of the “refreshment” tables nearing the end of the evening. The photo above was taken at Ichon station, but it shows something that I think that I have seen at every suburban railway station that I have been to in Seoul. 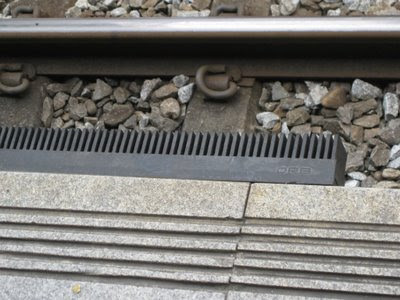 The black rubbery material affixed to the edge of the platform is called "Platform Gap Filler" and it is made by a Korean company called DRB (Dongil Rubber Belt Co.). As the Company product information says: "monolithically mounted on the front side of the platform, this device enables the passenger to get on and off the train safety (sic) by reducing the gap between the platform and the entrance of the subway car when the subway operating stops at a platform". Strips of this material are strategically located at positions on the platforms where the subway car doors open thus reducing the likelihood of a passenger slipping through the gap between the platform and the subway car. 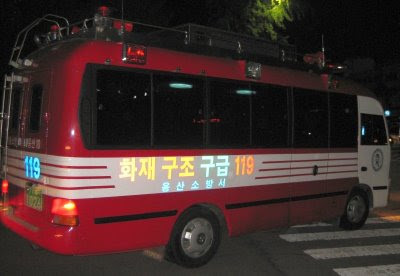 A fire engine rolls out of Yongsan fire station last night and heads north towards downtown. 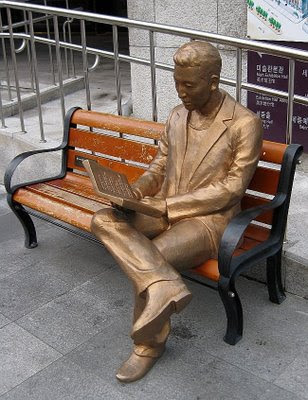 I came across this sculpture in Downtown Seoul yesterday. 15 August is called Liberation Day in Korea (V-J Day in the US) and commemorates the liberation of Korea from Japanese rule in 1945. 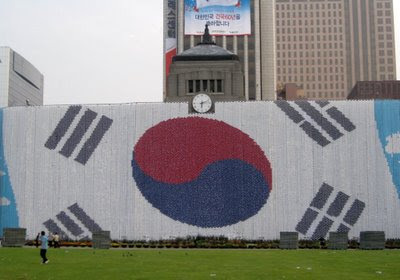 To mark this special day on the Korean calendar, Seoul City Hall has been decorated with a giant Korean flag. The flag is made up of a series of plastic spheres (as shown here). I have written elsewhere about the The Changing Face of City Hall. 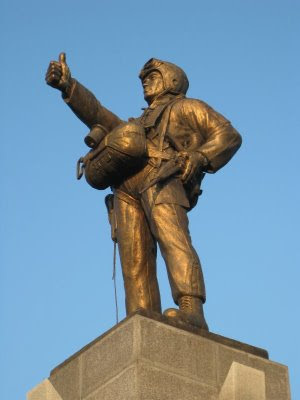 The monument to Korean paratroopers, located on the island under the Hangang Bridge (west side). 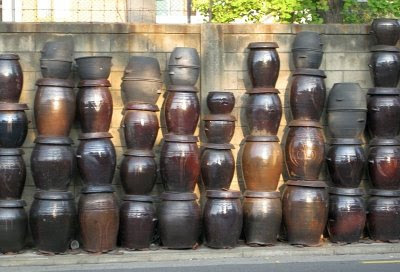 I saw these kimchi pots stacked up near the US Army Garrison, Yongsan. No, not the popular manhwa, or the Japanese pop music duo, or one of the members of the schoolgirl clique from "Grease", but someone who might otherwise be politely referred to as a "lady of the night", waiting for a client early on Sunday morning. 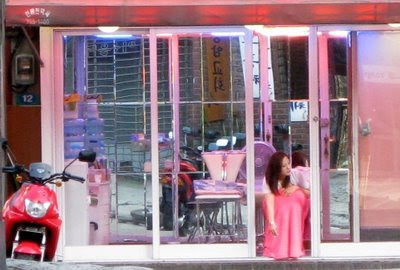 In the block of little streets and alley-ways behind the shopfronts directly opposite the Yongsan Station are rows of little glass-fronted rooms like the one above which are reminiscent of those in the red-light district of Amsterdam. However, pink-lights seem to be preferred here over the more "traditional" red-lights. Interestingly, similar coloured lights are used to highlight the meat in butchers' shops in Seoul. The view to the west from Hanganggyo; the tall building is the 63 Building. 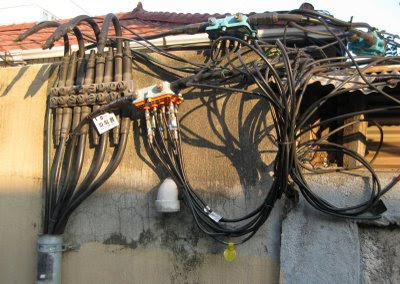 I saw this interesting example of the electrician's art in Yongsan. 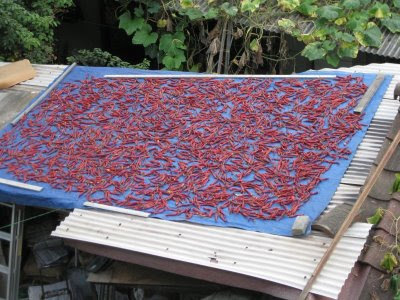 Red peppers (gochu) drying on a rooftop in Yongsan. 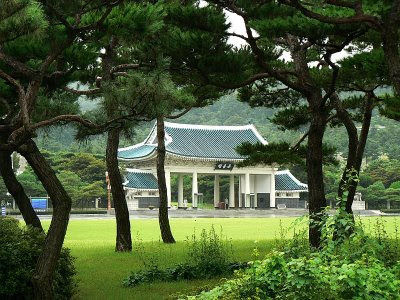 Today's photo was taken in the National Cemetery of Korea. While it is a terribly sad and silent tribute to those who gave their lives in the pursuit of the freedoms that South Koreans enjoy today, it is also a place that I like to go to get away from the hurly burly of the streets of Seoul. 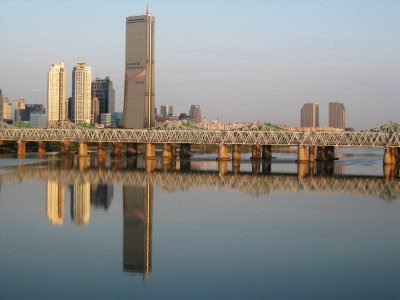 It features beautiful gardens, a lake and some excellent views to the East along the Han River. 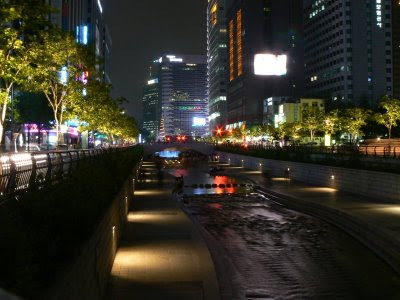 An evening view of Cheonggyecheon, downtown Seoul. 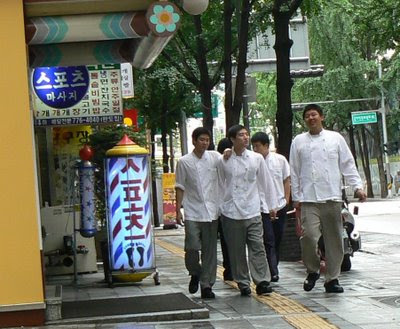 I spotted this group of chefs walking near Seoul Plaza one Sunday morning. I wonder what is the collective noun for a group of chefs? 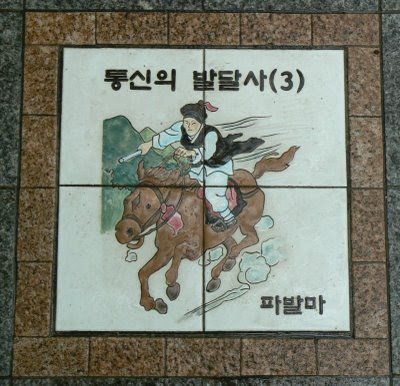 This is one of a series of pictures made from ceramic tiles, depicting different forms of communication used in Korea, from ancient times to the present day. 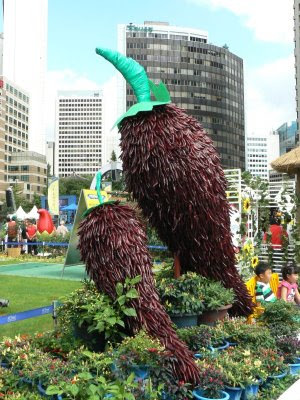 They are set in the pavement in a small park-like area near the Jogye-sa temple in Jongno. 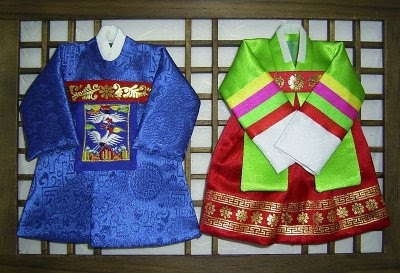 Miniature Hanbok (traditional Korean dress). The male costume is on the left and the female on the right. They are about 20 cm tall and are mounted on a frame with a hook for hanging. Unidentified sea creatures served raw form part of the first course of a meal at a seafood restaurant. My Korean hosts were not able to give me an English-language name for them. The orange-coloured flesh on the right had a kind of metallic taste with hard teeth-busting pieces, but was quite tasty. The objects on the left were slimy with a chewy gristle-like centre. I'll try anything (well, almost) once! 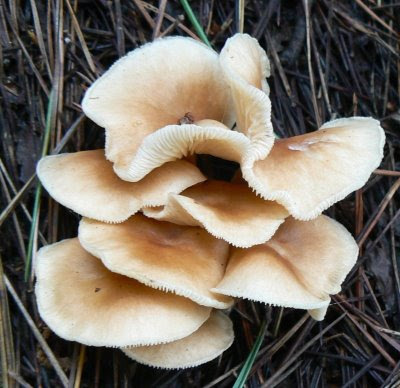 An unusual looking fungus growing in the leaf litter on Kwanaksan. 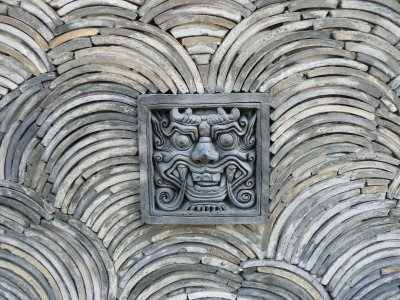 Decorative detail on a wall near Gyeongbok Palace.